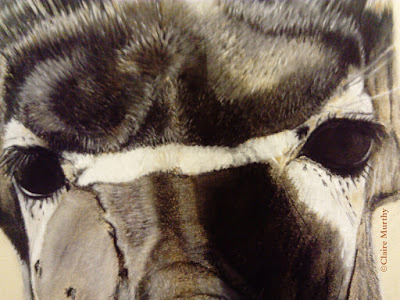 The realism in the fine art wildlife paintings is gained through many decades of interest in and understanding of animals, which has extended beyond the local wildlife to further afield wildlife of Africa, America and Asia, both in the wild and from spending time in wildlife parks. The style of these paintings is traditional fine art and they are mainly of pastel and watercolour wildlife art paintings. The wildlife art seeks a realistic interpretation of the animals but one in which the spirit, or soul, of the animal is recognised - not a photographic reality. A human-like expression was noticed when looking closely at the antelope’s face. This led to this close up pastel painting to portray an intensity in his eyes. Standing close to the painting, the detail is familiar: the depth of eyes, the veins, the weathered look, the resting energy. The painting holds an element of curiosity about it; being an antelope, without horns and few whiskers, he is less identifiable. It strikes up a conversation: is he a giraffe, some kind of antelope, a horse.. At first glance, from a distance, he looks almost human. Are we bridged by thoughts beyond the physical appearance..?